If you follow me on Instagram, you may have noticed that I recently revamped my makeup storage! Because I still loie at home. I have a small bedroom that unfortunately has no room for a vanity. My room also bears the full brunt of the Australian sun throughout the year, so my room will always be hot and muggy which doesn't help. 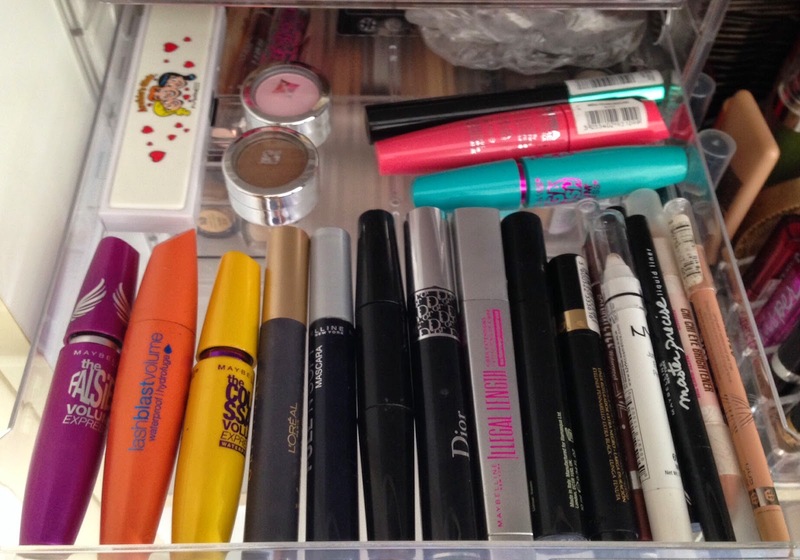 Because of this, I keep my makeup collection in my wardrobe in the drawers meant for clothes.. Up until now anyway! I finally found clear affordable acrylic drawers (courtesy of Wild Glossy), and had a ball reorganising my makeup collection into it. Because I got a lot of questions about the storage, I thought that I would do this blog post dedicated to the storage and where I got it. while simultaneously showing you how I organised my collection! A couple of side notes; I am from Australia, so unfortunately I do not know whether the US versions of these stores stock the same storage! Also, this is in no way to brag about what I have or rub it in anyone's face. This has been collected over years and years, and I honestly love and adore my collection. This post has been put together to hopefully give you some ideas for your storage, and how you can organise your own collection! This is the top part of my storage. I have two of these acrylic drawers (on the left) that I got from Officeworks for about $17 each, and I use them to hold my main collection. There is two versions of these drawers - one has five smaller drawers, and the other (mine) has four drawers. I got the four drawers, because the last drawer is deep rather than being the same size as the others! I'll be going through each drawer individually further on in the post, to give you an idea on how it has been organised! Behind this, I have my all my brushes that are in an old candle holder. This cosmetic organiser is from Kmart, and I got mine for $7. I basically use this to hold the products that I would use on an everyday basis, and also for products that I tend to forget to use. I plan to switch these out quite often, so that way everything gets some use! 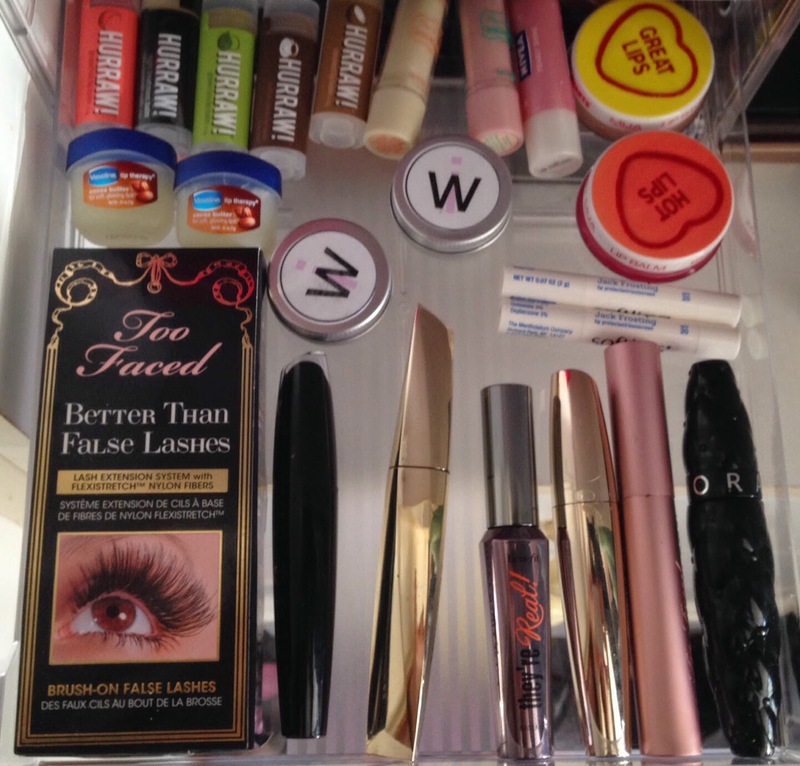 This organiser is fantastic, it has a place for your foundations/primers etc, two columns that I put my mascara in, 12 lipstick holders and another small space where I keep my MAC Mineralize Natural and my current eyebrow product. I keep these next to my everyday organiser, because there isn't any room for them in the actual organiser. But I use all of these (except the second NYX Dewy Finish Setting Spray because it's a back up) on an everyday basis as well. On top of the first set of acrylic drawers, I have my eyelash curler, my little palette that I use for my foundation and a smaller lipstick holder that my YSL Rouge Voluptes sit in.. Because, y'know, they're the queens of my makeup collection, so it's only fitting that they sit on top and survey the rest. Onto the first drawer in my acrylic set. 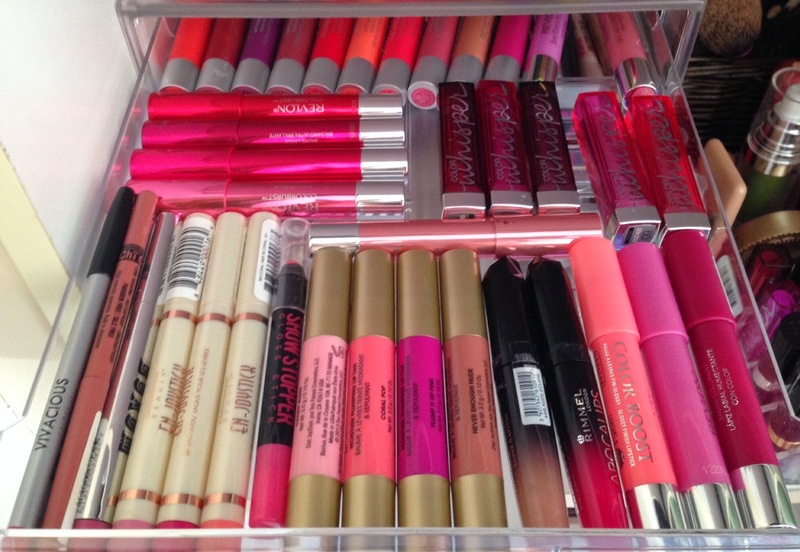 This drawer holds ALL of my lip crayons and liners, plus some Maybelline Colour Whispers and Rimmel Apocalips. The second drawer hold some of my favourite mascara and eyeliners, plus my MAC Archie's Girls Spoiled Rich Palette, some loose Jordana shadow pots and my broken Naked Basics Palette. I really need to throw it out, as its pretty much unusable but I don't have the strength just yet. Sob! 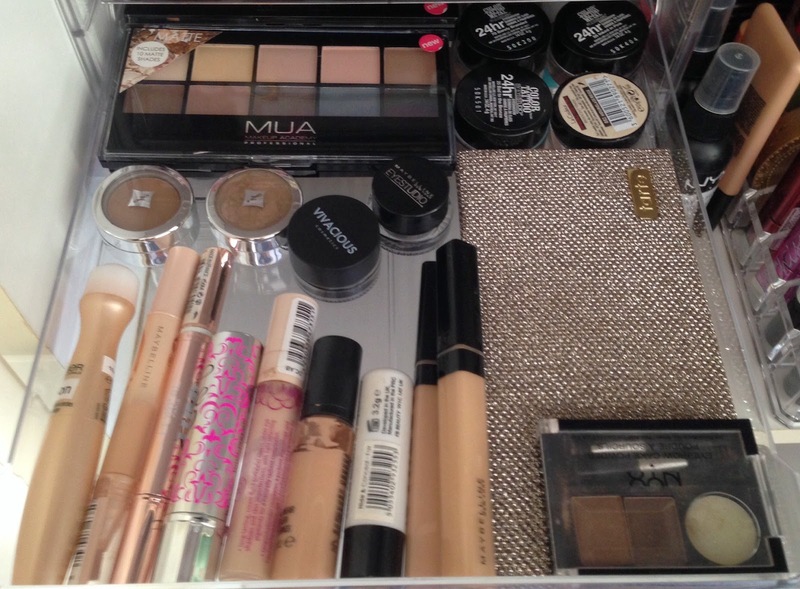 Third drawer down holds some MUA palettes, Maybelline Colour Tattoos, more Jordana loose eyeshadows and gel liners. It also holds my Tarte Off The Cuff palette, my concealers that I don't use everyday, and my NYX Eyebrow Cake. 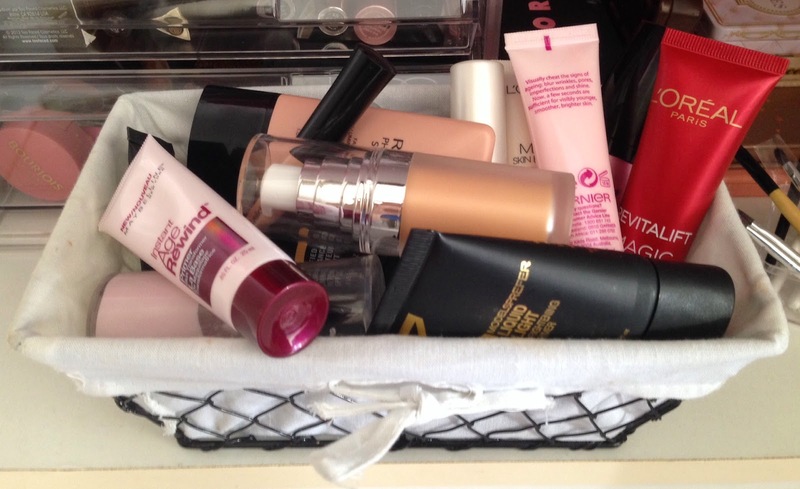 Fourth drawer down, and my personal favourite, holds most of my foundations and powders. 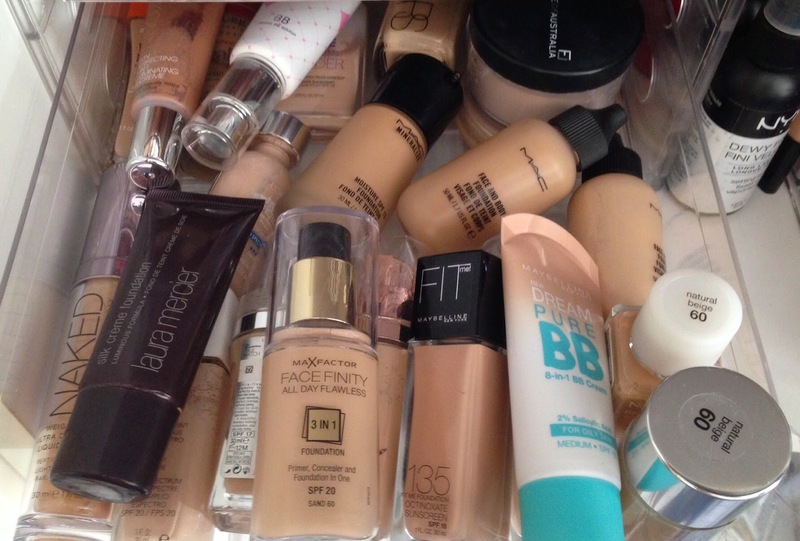 As a foundation junkie, this is of course my pride and joy. There will be first impressions and reviews coming soon on some of these so keep your eyes peeled! This is my second set of acrylic drawers! I just love how colour coordinated this looks honestly..
My primer basket <3 I don't know where this came from, I got a hamper for Christmas last year and this is what was included in it. I try to switch out my primers on a regular basis, but also with what I feel like my skin needs at the time. 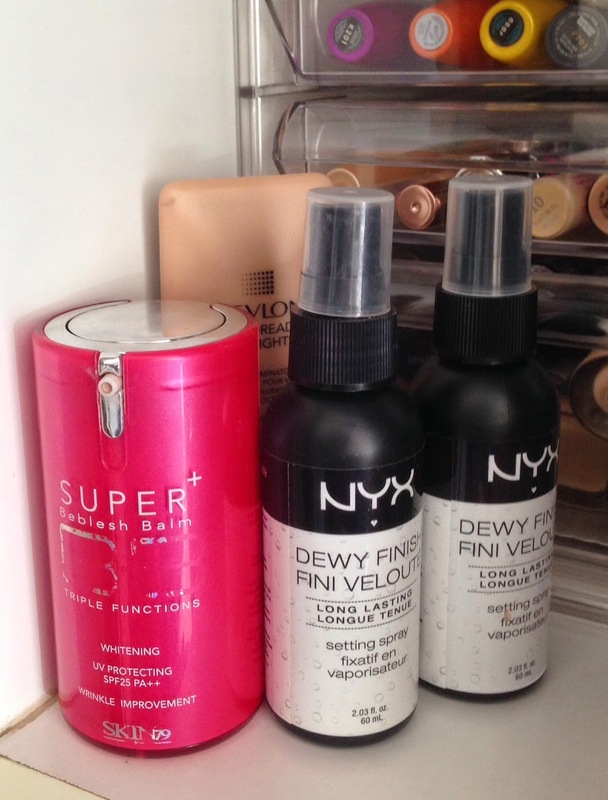 My primers sit on top of my acrylic drawers, as well as my Victoria Secret makeup bag, which I switch out with products that I am using that day. I also have two EOS lip balms that sit on top as well - purely for decoration, as I'm not an actual fan of the balms themselves. 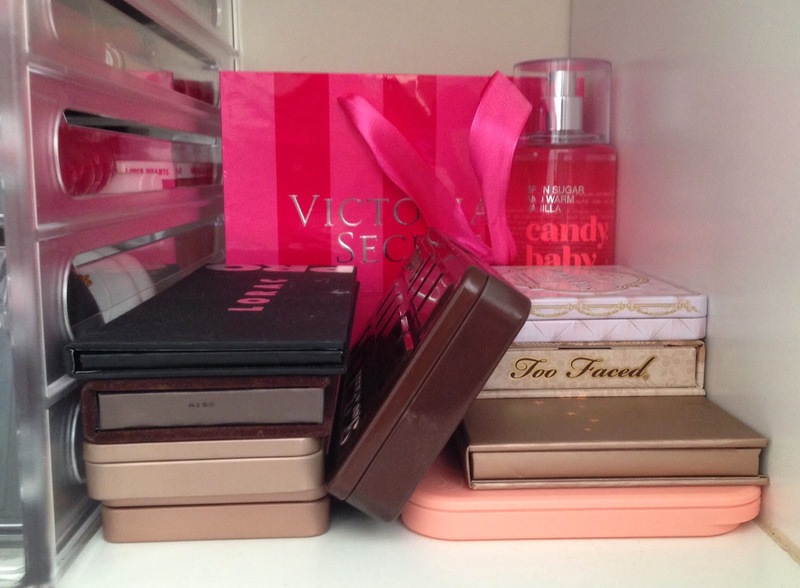 Next to my drawers, I have my higher end palettes that I actually use on a more regular basis. It's easier to have these here, so that I can reach for them when I need them. The Victoria Secret bag holds my empty products (if I remember to put them in there) and a back up of my favourite Victoria Secret Candy Baby spray. It smells like fairy floss - so good! The first drawer of my second set of acrylic drawers holds my higher end lipsticks, plus some of my drugstore because they don't really fit in my drugstore lipsticks drawer. You'll see why in a second.. 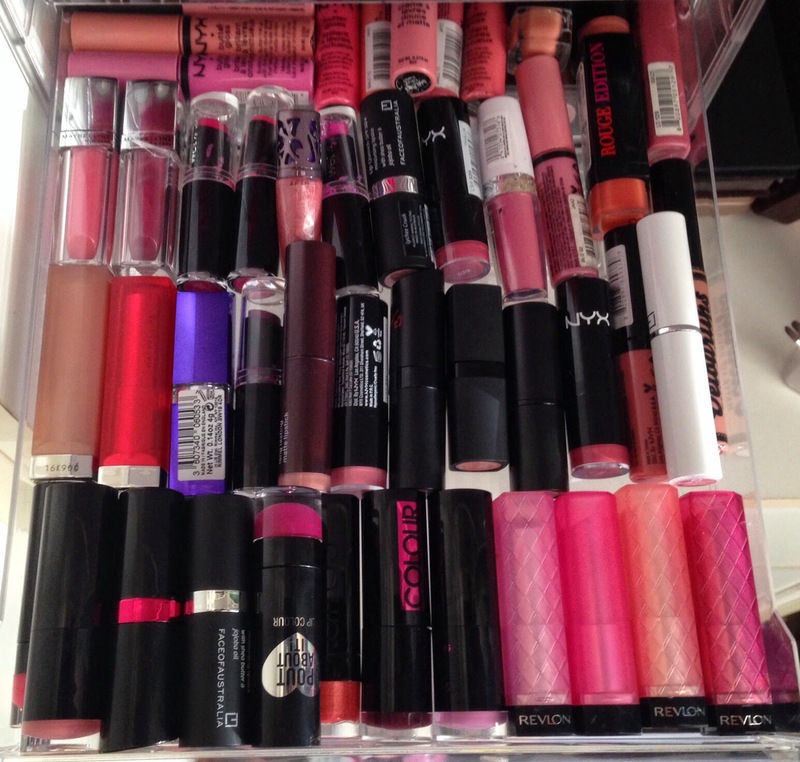 This is my drugstore lipstick drawer - or, the drawer of desperation as it's getting hard to get this drawer to close. At some point, I will reorganise this drawer, but for now it will have to do! The third drawer down holds the rest of my mascaras - honestly I switch between these and the ones in my first set of drawers all the time. Which is good because I have variety, but also seriously bad because I have a million different mascaras open at the same time. 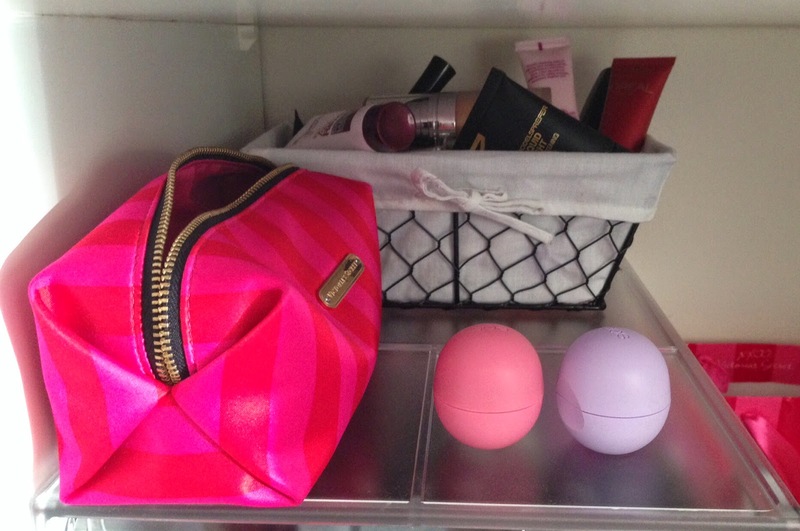 I also have some of my lip balms and tinted lip balms just hanging out in the back. 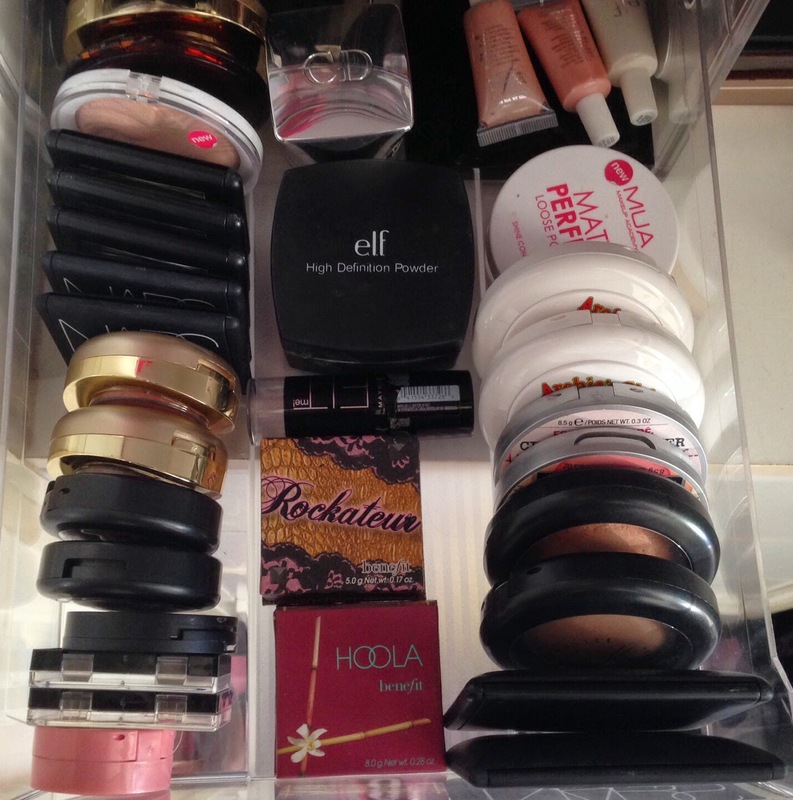 My last drawer holds the rest of my powders, bronzers, blushes and highlighters. I love how this looks, so easy to organise this! Everything just fits so perfectly! 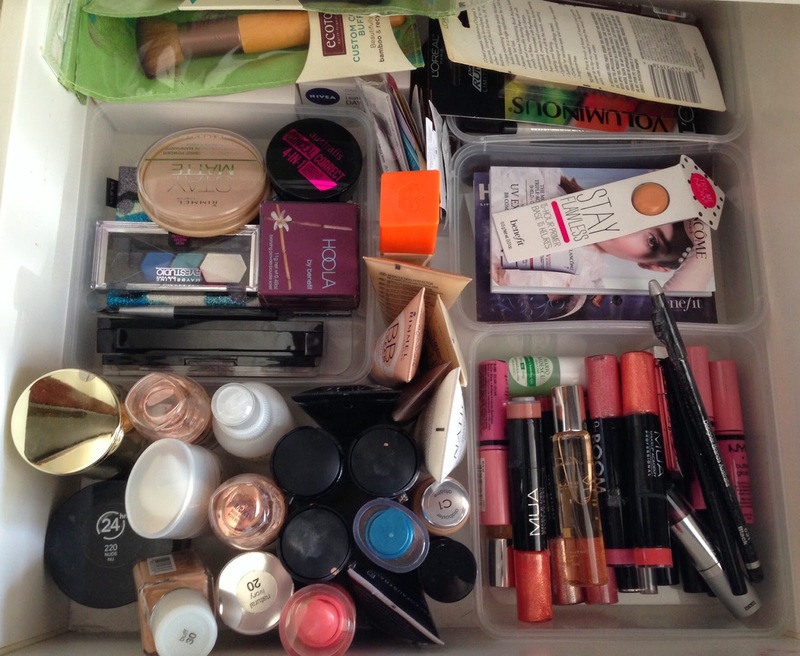 If I wasn't a foundation junkie, this would hands down be my favourite drawer. 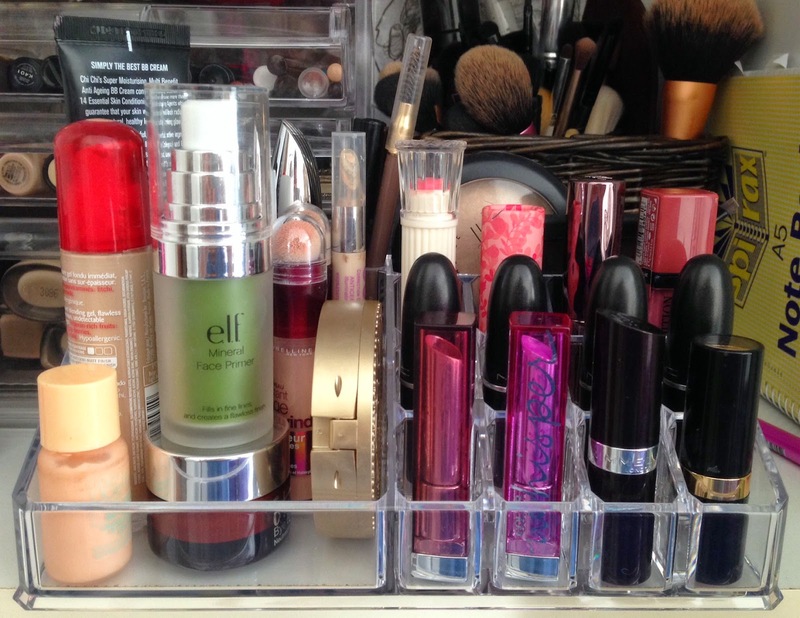 After my acrylic drawers, I have two more actual drawers that hold the rest of my products. In here, I have product back ups, products that I didn't particularly get on with, extra products that don't fit in the acrylic drawers and of course my samples. 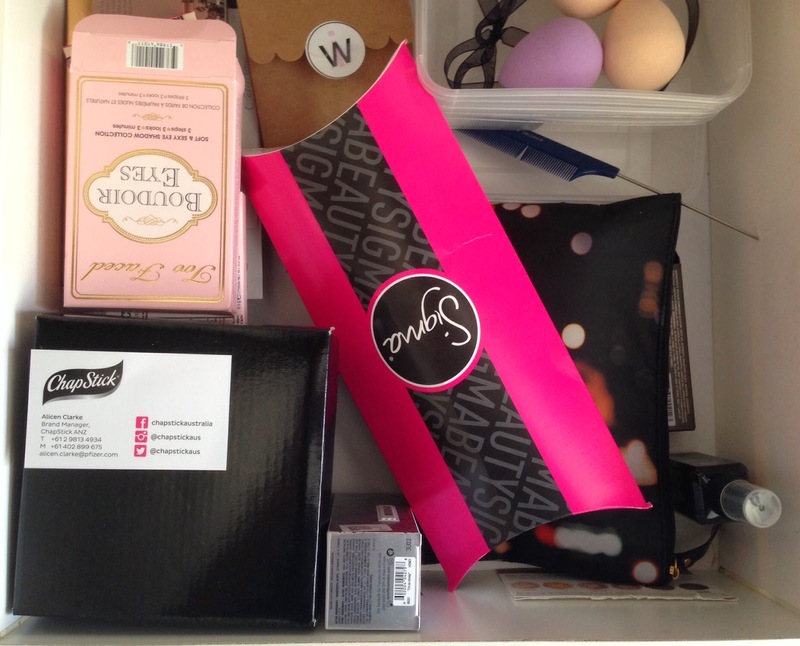 The second drawer holds some more Chapsticks, my Sigma Jaclyn Hill box set, some packaging that I don't want to let go of and some supposed beauty blender dupes that my Mum got off eBay (total waste of space). And that's it for today's post! 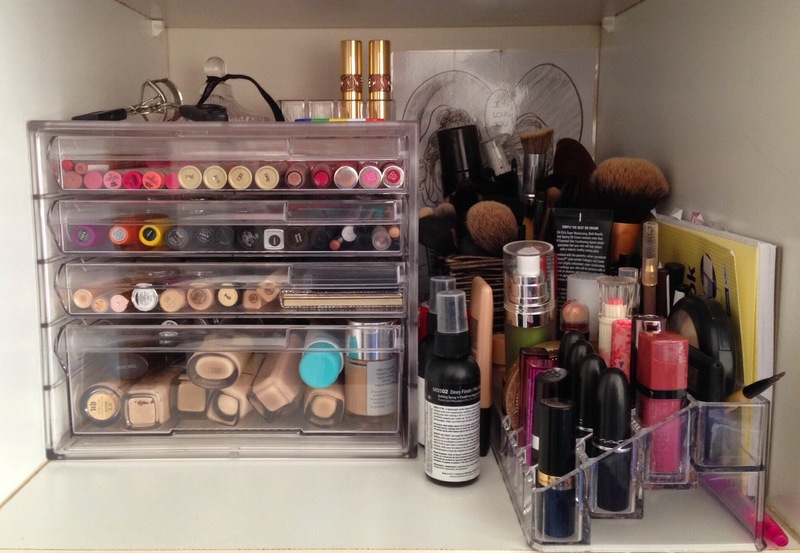 I hope this helps some of you on some makeup storage idea, and how to organise them. I know that before this, I used to fantasise about having proper storage but I had no idea where to start! One day, I will have a proper vanity, with all the trimmings, but today is not that day and I honestly am loving how it looks at the moment. If you see any products in these photos that you would like to see a review on, please let me know! I have been dying to see this post! Amazing collection bebe! Looks so so great. Lipstick draw makes me go cray! Acrylic lipstick holder is available at Original beauty box. 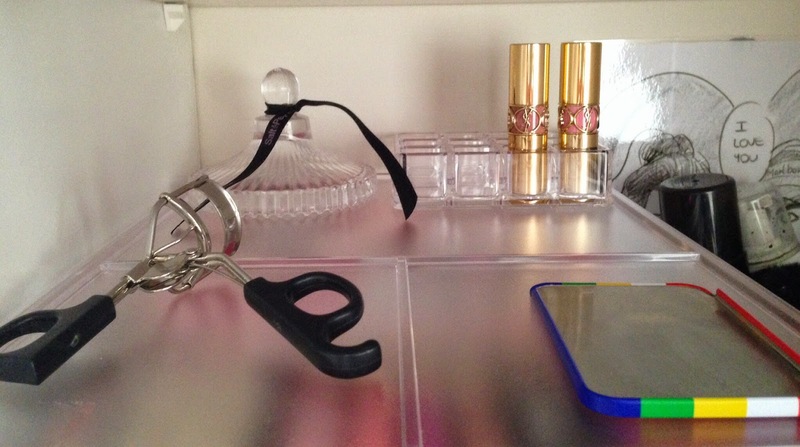 These holders are a very convenient medium to store and organize our lipstick. All our beautiful lipstick shades find a perfect place. 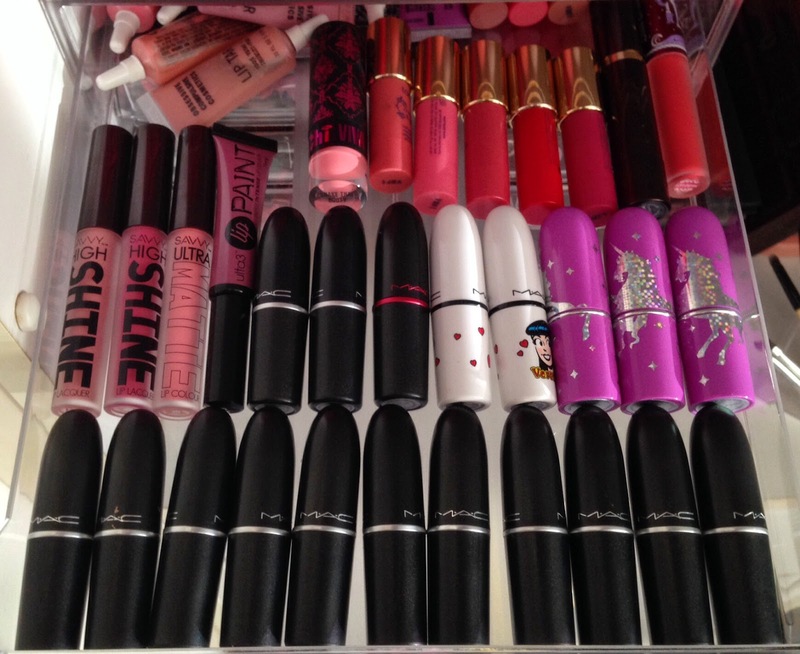 Lipstick holders don’t occupy a lot of space and can be kept in the corner of our dressing table. The shades of lipstick mix with each other in case they fall down. 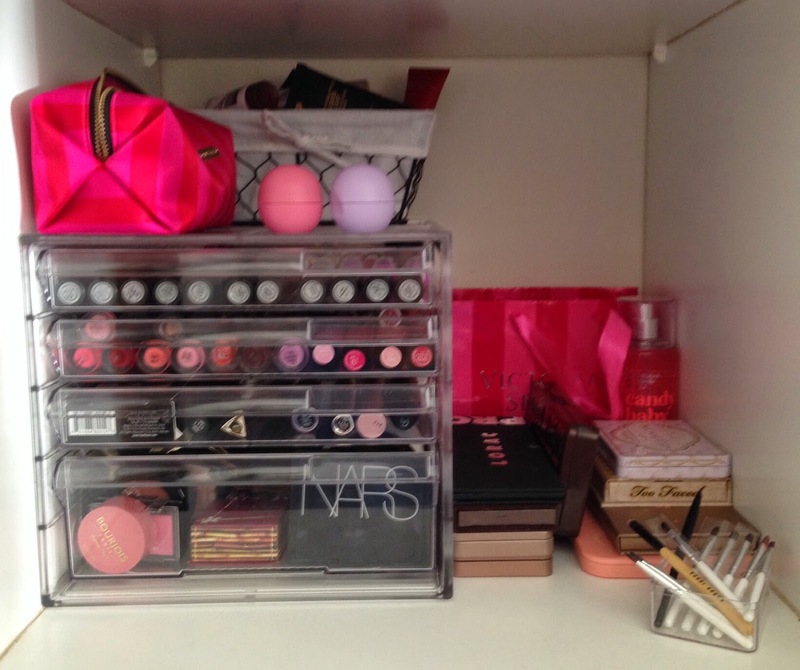 The clear acrylic makeup organizers are one of its own varieties. These makeup organizers manufactured out of acrylic are of unique quality. The unique quality of the organizers adds up to its durability.